“It was an opportunity for us to learn Cuba even more and an opportunity for us to share what we know about Cuba with others,” says Davidson, who is the company’s co-owner and managing director. With the death of Cuba’s former leader Fidel Castro on November 26 and President-elect Trump’s threat to sever ties with the island nation again, Davidson says she’s been flooded with calls from family, friends and clients, fearful that upcoming planned programs won’t happen. However, she’s optimistic that her growing travel business will not be negatively impacted. “There were things opening up slowly for a number of years and so I don’t think him passing will make those things move any quicker and I don’t think that him passing is going to make people think oh, let’s roll them back,” Davidson tells NBCBLK. The travel aficionado added that she thinks that as more commercial businesses, like airlines and hotel chains become more involved on the island, reversing the progress already made will be even more unlikely. As she prepares to head to Cuba in mid-December with two groups, Davidson is focused on ensuring all of her clients have one-of-a-kind experiences on the island, such as the one Gbenga Taylor had when he traveled to Cuba with DiasporaES over the summer. “There’s so many situations where I had people come to me and be like you’re my brother, you’re my long lost brother,” Taylor explains. He described how hearing that from Cuban men of African descent really affected him. And, how seeing things like a group of Rastafarians gathering near an outdoor market on Obispo Street in Havana as well as women singing in the Yoruba language he grew up hearing in his native Nigeria were unforgettable. “I knew there were Afro-Cubans. I didn’t expect how strong it [the African culture] was. That was the difference for me. It is pervasive throughout society…that just blew my mind,” Taylor tells NBCBLK. The Washington D.C. resident was part of a group of Black professionals from across the U.S. who traveled to Cuba for the first time and wanted to experience the African influences on the island’s culture. Having the Afro-Cuban experience was so important to me… I know that we have a rich history here as a person of African heritage. I am African-American. It’s important for me to learn my roots in the Americas as they unrolled everywhere that we’ve been as people of African heritage,” says Kafi Sanders, a pharmaceutical scientist from New York City who was also on that trip. DiasporaES specifically designed an itinerary for this group to introduce them to Afro-Cuban culture. 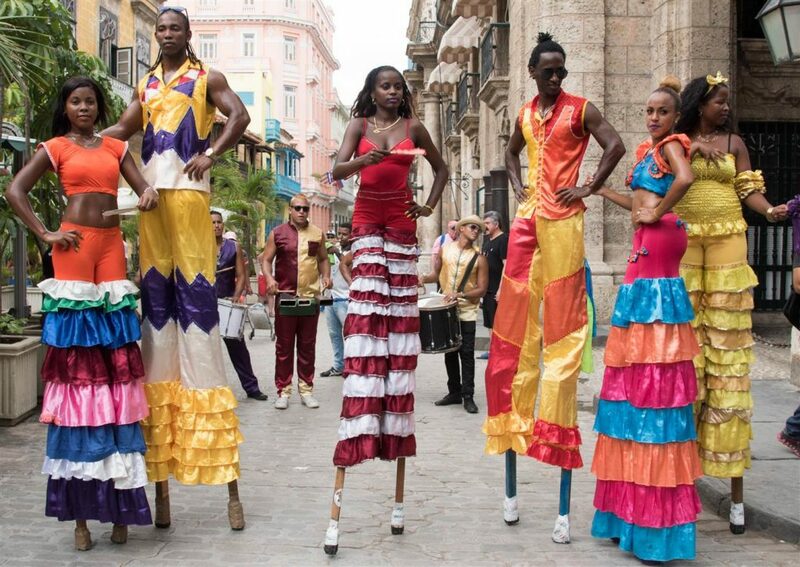 From visits to Calejón de Hamel (Hamel Alley) and Casa de Africa (House of Africa) Museum to dance encounters where the African roots of salsa and rumba were taught along with the steps, the company says the goal was not only to introduce this travel group to the concept of Afro Cuba, but that Afro Cuba is Cuba. Davidson expects those opportunities for DiasporaES to create unique travel experiences to continue to grow as curiosity and conversation about Cuba grows. Share your travel perspective by heading over to our Contribute page.